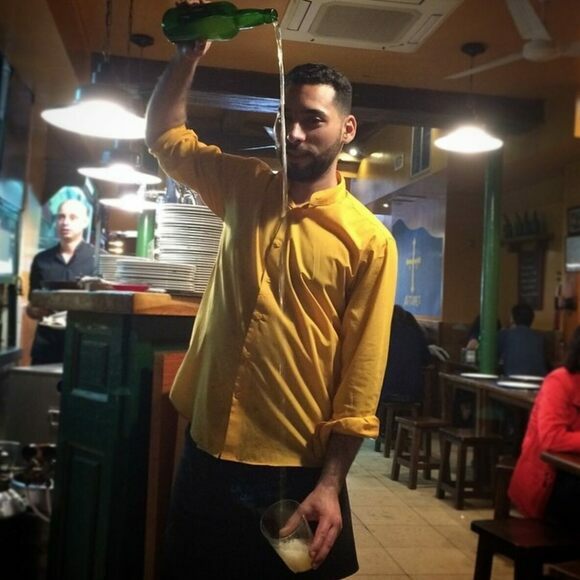 In Spain’s northern region of Asturias, cider pouring is more performance art than table service. At local cider-focused bars, known as siderias, servers pop the cork, then hoist the open bottle high into the air. One hand tips the bottle, while the other catches the cloudy concoction into a glass held at waist height until it’s roughly one quarter full. The servers aren’t just capitalizing on an opportunity for theatrics, they’re enhancing the taste of the beverage. Asturian cider has a few defining characteristics: It comes from five varieties of apple that are fermented into a funky medley of “barnyard” flavors, it contains around 6 percent alcohol, and it’s also almost entirely flat. The long-distance cascade into the glass creates a splash that supplies much-needed effervescence and foam, which help release the cider’s aromas. Since bartenders might spill a few drops of precious cider in the process (perhaps due to all their no-look pours), some restaurants litter the floor with sawdust to absorb the constant splashing or spills. Rather than sipping and savoring the tart drink, patrons should shoot their minuscule pour back in one, swift go. The drinker then shakes out the last splash of cider to freshen the cup for the next drinker. Yes, that does mean people sometimes share glasses. And yes, this entire ritual has to be repeated every time someone wants another pour. Unless you’re willing to share a big portion of the bottle with the floor, leaving the pouring to the professionals. In Asturias, you don't order a glass of cider. You order a bottle. The waiter will pour it for you, unless you'd like to test your luck (and your aim) from several feet above your wine glass. This street is lined with siderias, which is how it earned the nickname Bulevar de la Sidra (Cider Boulevard). A sacred alcoholic drink made from chewed and fermented yuca.